You’ve Got Questions? Rev. Dr. Michael Eschelbach has answers! Rev. Eschelbach draws from thirty years of experience teaching the New Testament at the university level and in the parish. 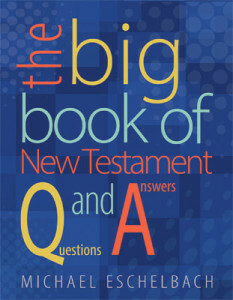 Using an easy to follow question and answer format, this book answers more than 2100 intriguing questions about the New Testament. The answers, which highlight and reference parallel biblical texts, demonstrate how all of Scripture is connected. Why do the Gospel accounts differ? Are there demon-possessed people today? What can we learn from the Epistles? It is arranged in biblical book order, and a topical index will help you easily find what you're looking for. Rev. Dr. Michael Eschelbach is professor of Theology and Philosophy at Concordia University Irvine. Prior to joining the faculty at CUI, Rev. Dr. Eschelbach was a member of the faculty at Concordia University Chicago for fourteen years. An active writer and speaker, Dr. Eschelbach has published articles, bible studies, and devotions in a wide variety of publications.